Checking out a competitors’ website to see how you match up? Researching blogs for your next banner ad campaign? Install PageRank Status to get a quick snapshot of every page you visit in your Chrome browser. 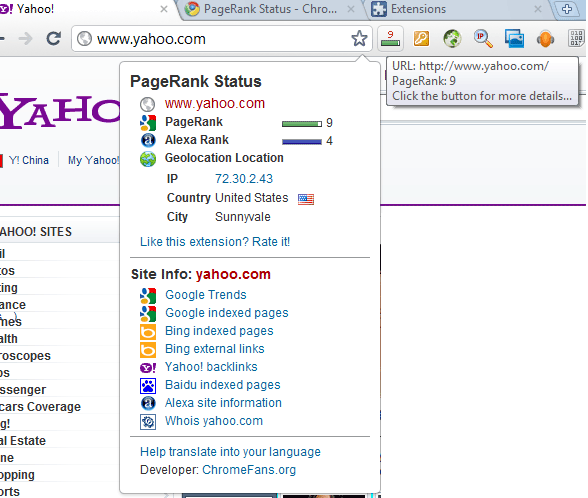 You’ll be able to view the Alexa Ranking, Google PageRank, Geolocation and indexed pages. This is all important information to determine a website’s value. Hiring an army of interns? Working on public relations projects? Enter Email for Salespeople. Let’s face it – in a startup everyone is a sales person. Yesware allows you to track emails and save templates from within your Gmail window. You’ll never have to guess if someone opened your email and will even know when and where they read it. The templates feature allows you to customize common messages within your Compose toolbar so you can say goodbye to copy/pasting consistent messaging like your office directions and PR campaign emails. After a few days of using Yesware it quickly becomes an essential tool for anyone that relies on email. Do you have an intimidating number of files in your Download folder? Attachments.mesyncs your inbox with cloud storage. Whenever you get an attachment you’d like to keep skip overloading your local Download folder. Just click add to your Dropbox or Google Drive folder and it’ll be sent there directly. This plugin is perfect for design projects that eat up space on your computer. If you frequently deal with certain types of large files, you can set preferences to automatically download those files to the cloud. Are you constantly sharing blog posts and articles to your social networks? 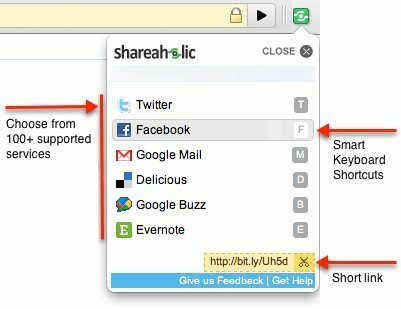 InstallingShareaholic allows you to share any page with the push of a button, but it’s the subtleties that make it valuable. You can add more accounts, share virtually anywhere and drill down metrics in your Shareaholic Dashboard. It’s the must have tool for any social media marketer. Notice a bug on your webapp? Need images for a Shareaholic guest blog post? InstallAwesome Screenshot so you can instantly take a screenshot of any web page. You can even make minor edits like point arrows to areas of interest and crop the image. Once you’re finished you can download the file locally, share a temporary link or host the image online. Do you have any plugins you’d like to share or questions about the ones mentioned? Let us know in the comments! This post originally appeared on the Shareaholic blog.